Google Sites | Website Builder by Google Inc.
Google Sites application comes as part of the Google Apps Productivity Suite. It stands separately in the world of the popular website builders, as it’s targeted mainly at building corporate, team-oriented websites, rather than personal web pages. This web-page creation tool can come in handy, in case you use it for the right purpose. Google Sites started off as JotSpot, a sole product developed by a software company offering enterprise-oriented software. Their potential users included small- and medium-sized businesses. JotSpot was founded by the co-founders of Excite web service, Joe Kraus and Graham Spencer. In May 2006 JotSpot was named one of the Infoworld’s ‘15 Start-ups to Watch’. Four months later this tool was acquired by Google. Google Sites as we know this service was unveiled on February 28, 2008. The service itself was free, but the customers had to obtain a domain name (which Google offered for $10). However, later Google Sites app became available for free, and without the need for a custom domain name. Ability to map your website to a custom domain, be it a personal Google Site or a Business account. Multi-tier permissions and accessibility. In case you use Google Documents, you’re already familiarized well with these settings. Google Sites work on the same principle: owners have full control over the website design and content, while editors can’t modify structural elements of the pages. Viewers can only visit the website, but they have no editing rights. Web pages built with Google Sites can be seamlessly synchronized with other popular Google products – Youtube, Google Maps, AdSense, Calendar, Google Docs etc. Limited customization. Compared with other website builders, Google Sites’ system is a bit ossified – you’re limited to the provided themes and structures, and there’s no way to integrate your own designs and layouts. Limited e-store functionality – must use Google i-store gadget, no third-party shopping carts allowed. 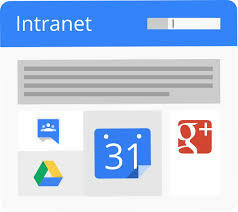 Google Sites can be a great solution for building a powerful, flexible intranet. This website building tool works best for business purposes, various clubs and groups, as it offers flexible collaboration and communication solutions. Google Sites on their own – you get the site and 100MB of storage. Google Apps Standard Edition – within this suite you get various Google products, including Google Sites + you get 10GB of space. In order to use Google Apps you need to have a custom domain. You can equally use a previously purchased web address or buy one through Google (at $10/year). Google Apps Team Edition – the same as the previous option, but with 100GB of storage and several add-ons. Google Apps Premier Edition – $50 per year; 10GB +500MB. This package doesn’t offer any bells and whistels within the site building tool, yet it gives access to other cool features for other Google products.